You don’t need a large garden to grow your fresh produce. Nor do you need years of experience to build your own DIY indoor grow system. That is the beauty of hydroponics. The entire discipline is based on flexibility and inventiveness. There are scores of DIY hydroponics plans floating around the World Wide Web. 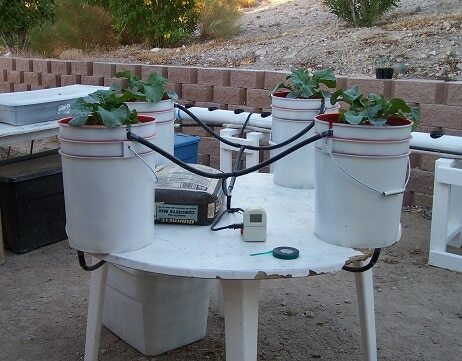 Here is a selection of the best homemade hydroponics plans anybody can build. These plans include beginner, intermediate, and expert level setups. The Kratky Method is no doubt one of the easiest hydroponic plans you can start by yourself within several hours. This system is great for anyone who just gets started with hydroponics. What you need is a bucket, some growing media (like hydroton, perlite), some net pots, hydroponic nutrients, and pH kits. These are all required to set up a passive system (no electricity required) that can run automatically for weeks without maintenance. You can grow green vegs like lettuces, spinaches at the start or fruits plants like tomatoes after you have got enough experiences. This is another simple hydroponic setups for beginners. All you need is a 5-gallon bucket, some growing media like coco coir or perlite-vermiculite, and nutrient mix. 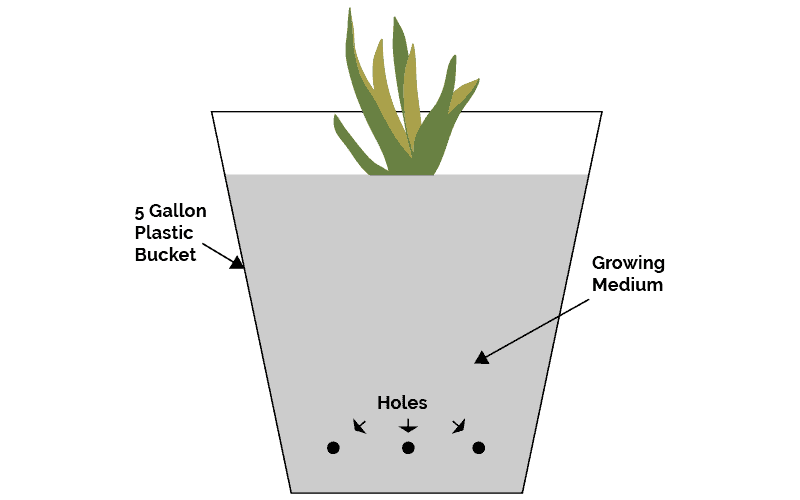 The setup works by using the growing media to make a capillary action, which moves nutrients up to the plants roots. This system is ideal for single large plants. If you want to keep things basic, you can water the system manually. For an automated system, you will need another bucket for the reservoir, and a submersible pump, and timer. Another entry-level option, this is a bit more advanced than the single bucket system above. It can still be cobbled together using parts that cost less $100 in total. The original plan calls for growing four plants in separate buckets, all fed by a common reservoir. This is a very flexible setup that can be expanded in Future. You can change the size of the containers, and reservoir depending on the size of plants involved. You can use large 4-gallon buckets or smaller containers. Remember to buy a larger reservoir in case you want to add more plants to the mix later on. This is a very cool project to get your feet wet in the world of hydroponics. It is also a great way to get your kids hooked to the field. As the name suggests, you will need an aquarium fish tank to make this work. This system can be used to grow small beans or even a single large lettuce. Along with the usual ingredients like nutrients, water, and plants, you will need a raft of barge fashioned out of foam. The system can be passive or active, using pumps and electricity. 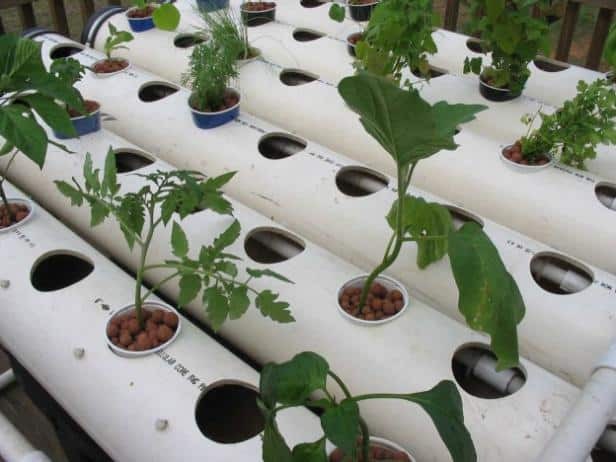 Large 4 inch PVC pipes can be used to create your homemade hydroponics system. In this plan, the plants are placed in cups which are arranged in holders drilled into the pipes. The system is watered using a reservoir and pump. This is a closed system, with the water circulating between the pipes and the reservoir. This plan is ideal for growing a lot of small plants within a small area. The basic system can house anywhere from 20-40 plants. This system can be placed indoors or outdoors. If indoors, grow lights are of course essential. The hydroponics method used in this plant is called NFT. It is an excellent plan for growing plants like tomatoes. This DIY plan is a very flexible system that can be moved around quite a lot. It can be made with any sized storage tub or bin. It should have a lid. The system uses PVC pipes, a submersible pump, and irrigation sprinkler heads to deliver nutrients and water to the plants. The plants are housed in net cups filled with some growing medium. The lid of the box will house these net cups. The frame hydroponic plan is very similar to the PVC hydroponic system. It uses the same NFT-based principles to feed nutrients and water to the plants. The difference here is the increased verticality. By adding new layers of PVC pipes at different heights, you can grow more plants in the same space. The amount of tubing required will increase, as will the complexity of the pumping system. This particular plan houses the PVC pipes on a wooden rack frame. You can grow herbs and plants like strawberries and tomatoes with this system. A unique concept that solves the problem of lighting while also creating a fascinating window display for the outside world. The plan involves using containers to hold plants in a vertical rack setup. Recycled water bottles make perfect containers. A system of pipes/tubes to bring nutrients from the reservoir to the plants. Lighting is of course provided by natural sunlight. This plan is ideal for herbs, kale, strawberries, and chard. This is another vertical hydroponics plan that uses a tower-like structure. The entire setup can be created for around $500. The tower is created using a fence post. The plan can be adapted for indoor and outdoor grows. The plants are housed in net cups that are spaced evenly across the length of the post in recesses cut into the post. A pump is used to pump water to the of the tower. The water flows down the inside, reaching every plant from top to bottom. The name says it all. This is a very cheap hydroponics system that can be placed on your desk. The plan is perfect for a small plant, like a herb or lettuce. This ideal for beginners who don't have much space to grow. The plan involves using a half gallon bucket or even a coffee can as the main container. The plant is housed in a net cup with a growing medium like rock wool. The most expensive part of this setup is a small bubbler. This is a low maintenance setup involving no electricity or motors. You have run into the Kratky method from the plan talked above. But this one uses Mason Jar instead of the bucket. This system requires no special tools or equipment. Most of the components are readily available in homes. As usual, net cups are used to hold the plants. These are then housed inside the mason jar lids. The net cups can be homemade using plastic cups that fit into the mouth of the mason jars. The jars are filled with the nutrient solution, and the plant's roots are allowed to grow into it. Dutch Buckets are also called BATO buckets. These are incredibly versatile containers that can be used in hydroponics systems of varying complexity. You can easily have a manual watering system where you apply the nutrient solution several times a day to the plants. Or you can go for a simple recirculating system using tubes, pump, and PVC pipes. To make an automated system, all that is needed is a simple timer. This grow system can be used for different sized plants. The larger plants can be given a whole bucket, while several smaller herbs can be housed in the same bucket. Depending on the scale of the system, you can grow a dutch bucket system indoors, or outdoors in a greenhouses/patios. If you want to grow stuff like tomatoes and lettuce indoors, this system is ideal. Growers usually use an opaque plastic storage box is perfect as the primary nutrient solution container. Depending on the size of the box, anywhere from two to eight plants can be grown in this system. The only other components require are a bubbler and some air hoses to pump in oxygen into the nutrient solution. The plants can be placed in net pots, underneath LED grow lights. Drip systems can be simple or complex, depending on your requirements and budget. In a passive system, you can forego the pumps and use gravity to bring the nutrient solution to the plants. This will call for some creative placement of the garden and reservoir. Or you can just use a submersible pump and a network of thin tubing to deliver the nutrient solution is small amounts to the plants. A growing medium is usually preferred for drip systems. Popular options include coir and perlite-vermiculite. This is another largely inexpensive homemade system that uses a storage tray or tote to house the entire grow operation. 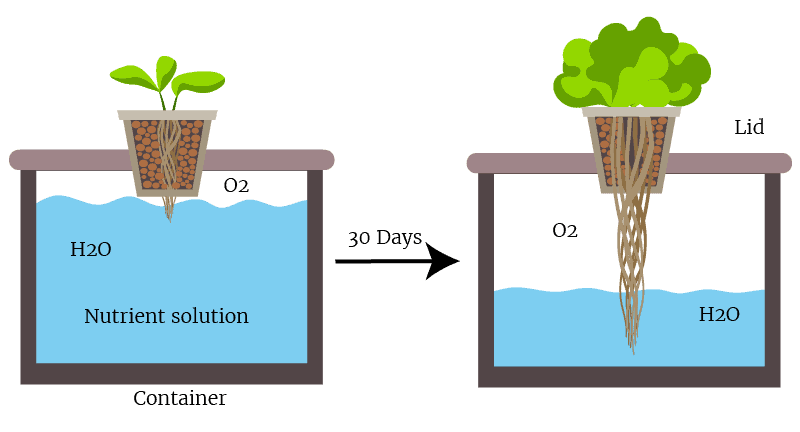 The ebb-flow system involves growing plants in a medium, and flooding the medium with nutrient solution for a few minutes at set intervals. It is also called a flood-drain system. This system will need a pump as well as a timer for automated operation. Stackable planters are very popular in smaller gardens to grow a lot of plants in smaller space. But these stacking systems can also be used for hydroponics. But you will have to factor in the irregular flow into the plants at the lower levels. Stacking is not a very efficient system for hydroponics for this reason. But it is still worth experimenting, with different plants that have different water and nutrient requirements. We have only scratched the surface of diversity in hydroponic systems. Homemade DIY hydroponics is both an art and science. You can make creative setups that not only produce lush growth but also end up looking aesthetically pleasing as well. The only limit is your imagination, and of course, the primary concern of getting enough nutrients for your plants! Sorry for the missing link. I have fixed it. You can check it now. Great - thanks for writing this summary of hydroponics systems! I'm just starting out and found it very helpful.